Directions: locate a branch approx 1.5 in in diameter and length of your preference. make sure branch is relatively smooth and clean. fill bottom of a medium to large sized planter pot with sand, place branch in and hold steady. mix plaster of paris according to directions and layer on top of sand, duct tape can hold your branch in place until plaster sets. paint stripes up tree, be creative with your colors! Let paint dry and add foam ball. secure feather boa to ball using straight pins ( hot glue tends to gunk up the feathers and you won't get that "fluffy" look. Decorate pot if you wish, and cover plaster of paris with material of choice, we chose feathers, but decorative rock would look nice, too. 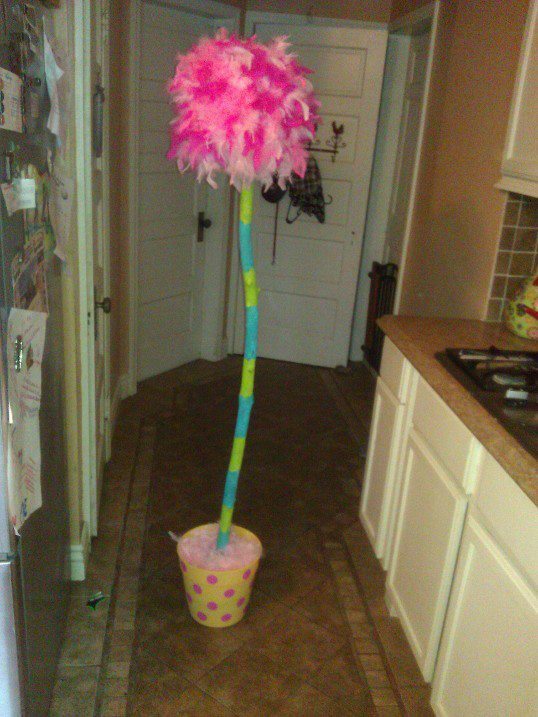 * We had the "Lorax" visit the neighbor kids in the middle of the night by leaving them a truffula tree. . . Be creative and leave them in places where they'll be treasured!!! This is just too darn cute! so creative :) Thanks for sharing your idea! I can't wait to make these for the kid's and pretend the lorax visited them :) thank you for sharing. I thought it was feather dusters tied together. I bet that would work. Really like this idea. Thanks.